Chicken, Spinach, Red Pepper, Red Onion, Thyme for Cooking spring dinner. Bright red pepper and sweet red onion add color to the spinach, all cooked lightly, more of a salad than a hot vegetable. I cut the breasts in half, the short way. They cook a bit faster and it makes a nicer presentation. Pick through the spinach, discarding any wilted or damaged leaves. Wash and spin dry if necessary. Juice the lemon, picking out pips. Heat 2 tsp oil in a large skillet. Add paprika and sauté 30 seconds. Add onion, pepper and sauté until crisp tender, about 5 minutes. Remove to a plate and cover to keep warm. Add chicken and brown on both sides. Cover the skillet, reduce heat and cook until chicken is done, another 5 - 7 minutes. Sprinkle with cheese and cover to melt. Remove chicken to a plate and cover to keep warm. Return pepper and onion to skillet with 2 tsp more olive oil. Heat through. Add spinach, lemon juice and sauté just until spinach wilts a bit 1 - 2 minutes. 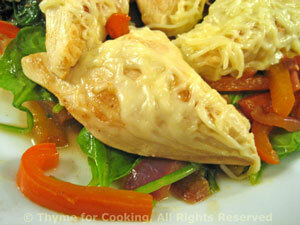 Put vegetables on individual plates, top with chicken and serve.